I’m sure it’s the American in me, but I don’t generally think of eating fruit as a dessert. A fruit sauce garnishing a dessert, yes. But just fruit, no. But really why not? It’s a relatively healthy treat and one my whole family will eat. This month, Tuesdays with Dorie has provided me the opportunity to try fruit as a dessert. We tried a recipe called Laurent’s Slow-Roasted Spiced Pineapple. A whole pineapple is peeled and cut into quarters. It is roasted slowly in a bath of liquor, orange juice, jelly or jam, and a variety of whole spices. I chose a mix of rum, orange marmalade, vanilla bean, cardamom pods, cinnamon stick, and fresh ginger. The house sure smelled wonderful while the pineapple was roasting! My husband enjoyed this treat together after our daughter went to bed. I decided the flavors were a little sophisticated for her. Plus, the rum. The marmalade I used was a little bitter and I wished I had used a sweeter jelly or jam, but my husband thought the bitterness went nicely with the rum. All in all, a successful dessert. I look forward to drizzling some of the leftover syrup on vanilla ice cream! A quick make-up: Last month I made Black-and-White Marbled Madeleines, but didn’t get a chance to write about them. Madeleines are always fun to make; I’m not sure why I don’t make them more often! These ones are scented with lime zest and vanilla. Half the batter is mixed with a bit of cocoa powder and melted milk chocolate. These were a fun treat! I didn’t get the traditional “hump” (Dorie warned us we wouldn’t), but they were still delicious. This post participates in Tuesdays with Dorie, a group devoted to baking through Dorie Greenspan’s baking books. Both these recipes can be found in the book Baking Chez Moi. Happy Tuesday! I’m back with another installment of Tuesdays with Dorie. This week we made Lemon Madeleines! I was excited about this one. 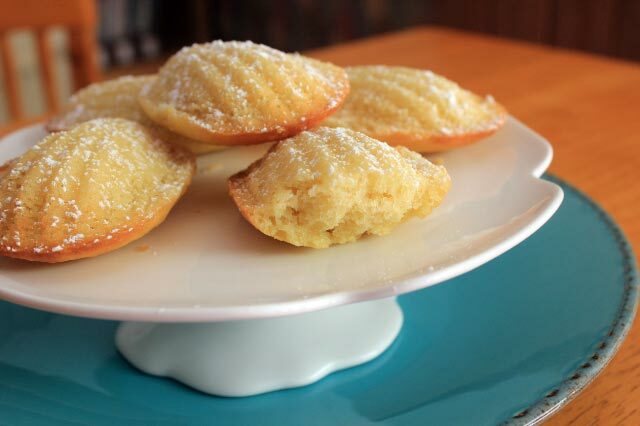 These were a basic Madeleine recipe, with the addition of lemon zest in the batter, and an optional lemon glaze. Dorie taught us a few techniques to help achieve the iconic Madeleine “bump”, specifically, chilling the batter and pan, and preheating the oven with a baking sheet in it. I left off the lemon glaze, mostly because I thought the little cakes would keep better without it. The lemon flavor of the finished Madeleines was very subtle; I’m sure it would be more pronounced with the glaze. I think you could easily leave out the zest and have a classic vanilla Madeleine. I did not get the classic bump, though my cakes were nicely rounded. They had a lovely, light texture. 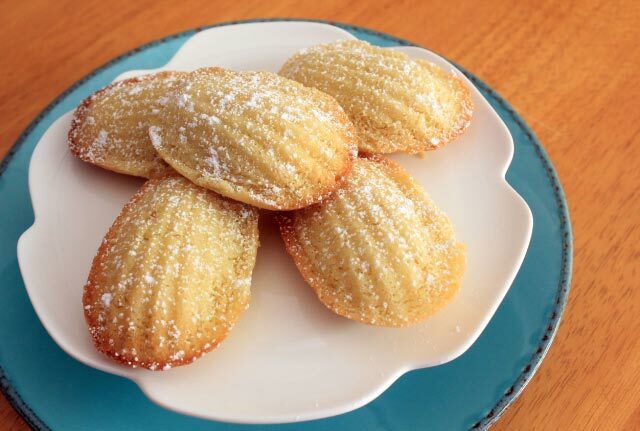 I have to confess I have never had professionally-made Madeleines, but the texture and flavor of these was so nice, I have to think it was close to “the real thing”. These are by far the best Madeleines I have ever made. If you live at a higher elevation and need help with your cakes, I highly recommend the book High Altitude Baking: 200 Delicious Recipes & Tips for Great Cookies, Cakes, Breads & More. I have a confession to make: I don’t think I have ever had madeleines (before now, and except for these flavored ones I made a while back). I often see the packaged ones in grocery stores, and while I instinctively knew I would like madeleines, I also knew the packaged cakes would not be worth buying. 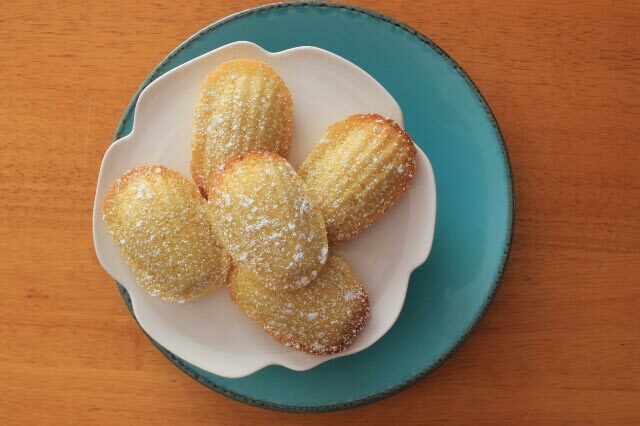 Madeleines are quite simple to make. I don’t know why I don’t make them more often! The hardest part is waiting overnight for the batter to rest before baking them. I can now say with certainty that I like madeleines! They are very flavorful for not having any added flavoring (such as vanilla). I also like that the recipe only makes 12 little cakes, so you don’t end up with way too many. If you are interesting in trying this recipe, you can check it out here at the USA Today site. While I did not test the theory, my sister informs me that letting the better rest overnight is important. Having an impatient 4 year old at home, she baked a few right after mixing the batter then baked the rest the next day. The ones baked the next day had a much better texture than the ones she baked right away. I made a couple of adjustments: I reduced the amount of baking powder by 1/16 teaspoon and I used 103 grams of egg. The recipe calls for 83 grams of egg, which ends up being about 1 and 1/3 egg. I used two whole eggs to get my 103 grams. The adjustments were close, but not quite right. While I got some of the “characteristic bump”, I think it could have been bigger. Also, the texture wasn’t quite right (though I am only guessing about this since my history with madeleines is limited). In the picture below, you can kind of see how the top the madeleine is a little “bubbly” looking on the cake in the upper-left. My recipe for August will be Apricot Flan Tart (page 141). I will share my results with you on or about August 27th.